What Is the Role of Helicobacter pylori in GERD? 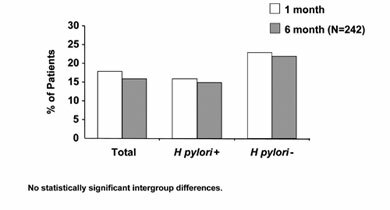 Do All Patients With GERD Need to Be Tested for Helicobacter pylori? Helicobacter pylori is a gram-negative, spiral, flagellated organism that infects the gastric mucosa, leading to chronic gastritis. It has been causally related to duodenal and gastric ulcers, gastric cancer, and gastric mucosa associated lymphoid tissue (MALT) lymphoma. It has been linked to the increased risk for development of ulcer disease in patients on nonsteroidal anti-inflammatory drugs and as a potential contributor to functional or nonulcer dyspepsia. There are three patterns of infections. Chronic active antral gastritis results in an increase in gastric acid secretion and duodenal ulcer risk. Chronic active corpus gastritis results in a decrease in acid secretion and an increase in gastric ulcer. The bug can result in chronic pangastritis, which is associated with atrophy, gastric intestinal metaplasia, and the perceived and documented increase in gastric cancer. The relationship of H. pylori and gastroesophageal reflux disease has been one of controversy. Some early studies suggested that eradication of H. pylori infection in the setting of duodenal ulcer disease would result in an increase in erosive esophagitis and GERD symptoms. 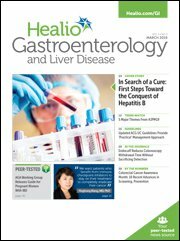 Although there are several studies to support this, the weight of the evidence suggests strongly that eradication of H. pylori has no effect on the development of heartburn and in fact does not exacerbate GERD symptoms when they are present at baseline. There are also several studies that suggest that in the setting of chronic corpus gastritis and/or panatrophic gastritis, the prevalence of erosive esophagitis, and, in fact, the frequency of Barrett’s esophagus, is less than in matched groups who do not have infection. This has led to some authorities proposing that H. pylori infection might be protective against severe end organ damage in patients with GERD. Frankly, this paradox of H. pylori infection being detrimental to the gastric mucosa and at the same time protective of the esophageal mucosa is difficult to reconcile. When one attempts to work their way through the data, I am comfortable with the following clinical caveats. H. pylori infection itself clearly does not cause GERD nor, in fact, have any dramatic effect on symptoms. Eradication of H. pylori does not, in my practice, appear to affect the natural history of or the treatment of GERD at all (Figure 36-1). It is, therefore, my recommendation that if the clinical presentation mandates investigation for Helicobacter (suspicion of gastric ulcer, duodenal ulcer, or in certain situations functional dyspepsia), testing for H. pylori is warranted. In the GERD patient, I find no role in my clinical practice for testing. Should testing be needed, active testing with either a stool antigen test or ureal breath test is preferred to serum immunoglobulin G (IgG) antibody testing as the increased sensitivity and specificity of the former outweigh the upfront cost advantages of the latter. Rapid urease testing of gastric biopsies should be performed if the patient is undergoing endoscopy and testing is indicated. I do not advocate routine biopsy of the gastric mucosa when endoscoping a patient with suspected gastroesophageal reflux disease. If H. pylori infection is present for whatever reason, I follow the standard recommendation that the organism be treated and use traditional proton pump inhibitor–based triple therapy for eradication. The patient seen in the emergency room with noncardiac chest pain is not a candidate for H. pylori testing, as the potential etiologies for her pain do not include gastric ulcer and/or duodenal ulcer in my opinion. It is highly unusual in my practice to recall any patient who experienced an improvement in their chronic chest pain with eradication of infection. The question as posed assumes that the noncardiac chest pain is due to reflux, which it may not be. Regardless, there is no reason to suspect that H. pylori eradication would make chest pain worse. It is worth commenting that using serology to document infection in this type of patient creates “more trouble than it is worth” as there is no way to determine without a careful history whether or not this represents active or old infection. Ultimately, the best course of action for Ms. Smith would be to evaluate and treat her for noncardiac chest pain with suspected esophageal etiology and not test for H. pylori at all.